July 14, 2017 /40 Comments/in Featured Articles, Jewish Ethnic Networking /by Andrew Joyce, Ph.D. In the introduction to his text, Ginsberg, a Professor of Political Science at Johns Hopkins University, outlines the structure of his argument along with his definition of Jewish resistance to the advance of National Socialism in Europe. Ginsberg’s definition of Jewish resistance is important because it differs significantly, in terms of its discursive parameters, from those generally employed in Holocaust historiography and its offshoots. For those interested in a more detailed exploration of the issue of Jewish resistance during World War II, as a subject of historiographical debate, The Holocaust in History by Michael R. Marrus (Penguin, 1989) and Histories of the Holocaust by Dan Stone (Oxford University Press, 2010) are perhaps the best and most succinct introductions to the most pertinent themes. However, in brief, historiographical argument prior to the 2010s was limited to two strands of thought, each biased and deeply flawed. The first strand of ‘resistance’ historiography was the negation of the idea of Jewish resistance. This involved lachrymose assertions that Jews offered no opposition to an unprovoked and irrational German hostility, and were led to sensationalized forms of mass murder like ‘lambs to the slaughter.’ A prime example within this strand is Martin Gilbert’s The Holocaust: The Jewish Tragedy (Harper Collins, 1986), and is also strongly associated with Raul Hilberg’s assessment that “the reaction pattern of the Jews is characterised by almost complete lack of resistance.” This first strand of argument was particularly popular in the diaspora, and in the United States and Great Britain in particular. The Holocaust developed as a cultural trope in these countries in tandem with the development of this lachrymose strand of historiography. Both of these strands suffered from severe methodological and theoretical failings in that both discussed Jewish resistance only within the sphere of armed, guerilla, partisan action. Even the briefest of glances through Jewish history would illuminate the fact that, at least since the sack of Jerusalem by Titus in AD 70, Jews have pursued their social and political goals via means significantly more abstract than armed conflict. Indeed, the century prior to World War II witnessed the development of modern Jewish politics, with features involving the consolidation of media power, the strengthening of transnational political networks, the development of international Jewish mutual aid networks (particularly following the Damascus Affair in 1840), and the ascent of the Jews into Western governments and the professions. It should therefore be regarded as remarkable that discussions of Jewish opposition to National Socialism should have neglected these international and incredibly influential spheres of influence as potential or actual avenues for resistance. Ginsberg’s unique contribution is to take the mainstream discussion of Jewish resistance into these neglected areas. Across four chapters, Ginsberg explores Jewish activism in the United States, the Soviet Union, in the field of counterintelligence, and in partisan warfare, and argues that Jewish actions in all spheres were crucial to the defeat of National Socialist Germany. Jews came to play major roles in the Communist Party and the Soviet state, taking key roles in areas such as “foreign affairs, propaganda, finance, administration, and industrial production.” Half of Lenin’s first Politburo were Jewish, and during the early decades of Communist rule Jews were “especially prominent” in the security services. For example, the Jewish pharmacist Genrikh Yagoda was head of the secret police during the 1930s, and specialized in preparing poisons for his agents to use in liquidating Stalin’s opponents. 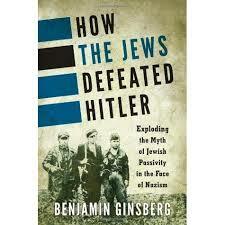 Ginsberg adds that “other high-ranking Jewish secret police officers included M.T. Gay, who headed the special department that conducted mass arrests during the “Great Terror” of the 1930s, and A.A. Slutsky and Boris Berman, who were in charge of Soviet terror and espionage abroad. Aside from warfare, Jews were essentially slave-masters overseeing the vast sphere of Soviet war production. The millions of Russians working ceaselessly in munitions factories came under the control of Boris Vannikov, deputy people’s commissar for armaments, while mass population movements of workers were orchestrated by the commissar for transport, Lazar Kaganovich. Those workers tasked with building more and more factories were under the control of the Director of the Commissariat for Construction, the Jew Semyon Ginsburg. Steel production (Semyon Reznikov), aviation (Solomon Sendler), naval construction (Grigory Kaplun), the chemical industry (Leon Loshkin), and the fields of electricity, heavy industry, and fuel, were under Jewish authority. The vast Russian workforce was essentially under Jewish control, and put to use in defense of Jewish interests. Meanwhile, the German workforce was operating on only one shift, continuing to produce consumer goods. Children went to school and women stayed at home. In the Soviet Union, the factories of the Jews operated every minute of every day, two million women were drafted into the military, and children were forced into the systems of production. A worker had to show up for work 66 hours per week, with only one day off per month. The JAFC found it easy to establish contact with similarly influential networks in the United States because that nation too had by World War II witnessed the rising power of the Jews. Ginsberg’s chapter on the United States is perhaps the most interesting of the entire text, and certainly from my own perspective justified the modest purchase price. Ginsberg begins by charting the rise of the Jews under FDR— a “long climb to power and prominence.” More than 15 percent of Roosevelt’s top-level appointees were Jews—at a time when Jews constituted less than 3 percent of the population. Jews became such a prominent and visible element of Roosevelt’s New Deal program (a term coined by the Jewish Samuel Rosenman) that opponents referred to it as the ‘Jew Deal.’ Ostensibly a purely economic platform, the New Deal acted as a gateway for Jews into a much wider array of influence. In common with the situation in the Soviet Union, American Jews used the film industry to mobilize non-Jewish support for Jewish interests. Most of America’s film studios had been founded by Jews, and the 1930s witnessed an outpouring of anti-German productions. Roosevelt would later personally thank the movie industry for its “splendid cooperation with all who are directing the expansion of our defense forces,” and intervened to secure a reduced sentence for Jewish fraudster and head of Twentieth Century Fox, Joseph Schenk, who had been convicted of income tax evasion (an incident with eerie premonitions of the pardon of Marc Rich under Bill Clinton for the same crime). The news media was also highly involved in the effort to shift public opinion, and both CBS and NBC (two of the most important networks) were owned by Jews. A. Joyce, ‘A Tactical Retreat on the Holocaust: Review of Final Solution: The Fate of the Jews, 1933-1949 by David Cesarani’, in The Occidental Quarterly, Vol. 16, No. 4 (Winter 2016-2017). B. Ginsburg, How the Jews Defeated Hitler: Exploding the Myth of Passivity in the Face of Nazism (New York: Rowman & Littlefield, 2016), p.1. For a more complete overview of this strand of argument see O. Kenan, Between Memory and History: The Evolution of Israeli Historiography of the Holocaust, 1945-1961 (Peter Lang Publishing, 2003).